Twin explosions at Christian churches in the eastern Pakistani city of Lahore have left at least 14 people dead, and almost 80 killed. A local Taliban faction has already claimed responsibility. The explosions happened minutes apart, during the Sunday services, in the mainly Christian suburb. Two churches were targeted: one Catholic, and one Protestant. They are located near each other. Bombers detonated the devices near the gates of both churches. "I was sitting at a shop near the church when a blast jolted the area. I rushed towards the spot and saw the security guard scuffle with a man who was trying to enter the church, after failing, he blew himself up. I saw his body parts flying through the air,"witness Amir Masih told Reuters. The guard was killed as well, Masih added. The death toll of 14 people may rise, as “rescue operations are still under way,” rescue services spokesman Sajjad Hussain said. Following the explosions, locals lynched two men they suspected were involved, and journalist Riaz Ahmed told Reuters he had seen two burned bodies at an intersection. Lahore has the largest Christian community in Pakistan, and locals have taken to the streets of Lahore, Peshawar, and Karachi to protest a lack of security, Tass news agency reported. They are demanding that the country’s premier step down. Pope Francis said that he feels great pain over the church attacks. "These are Christian churches. Christians are persecuted, our brothers spill their blood simply because they are Christians," the pontiff said, as quoted by Reuters. The local Taliban faction Jamatul Ahrar has claimed responsibility for the deadly blasts. 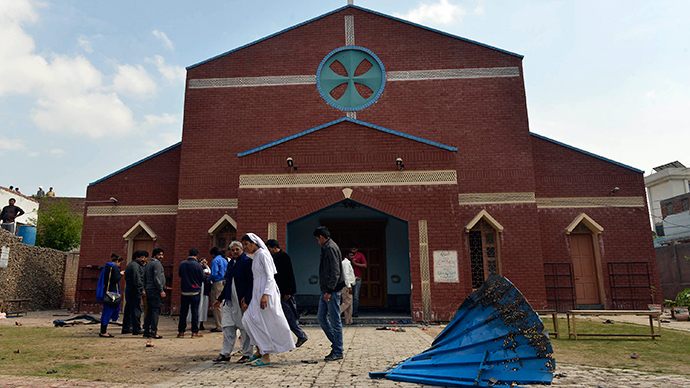 Attacks on religious institutions in Lahore have become more frequent since last year when the Pakistani government refused to hold peace negotiations with the Taliban. The previous largest attack on Christians in Pakistan occurred in 2013, when 80 people were killed by bombers at a church in Peshawar.